You know a picture tells a thousand words right? Well if you take a looksee over there at that cheeseburger from Tommi's Burger Joint in Marylebone, I could probably finish this post right now. I'll go on though (but hopefully not for a thousand words). It looks delicious doesn't it? You just want to eat it and savour every glistening, juicy, cheesy mouthful. You might be able to tell that I like Tommi's a lot. 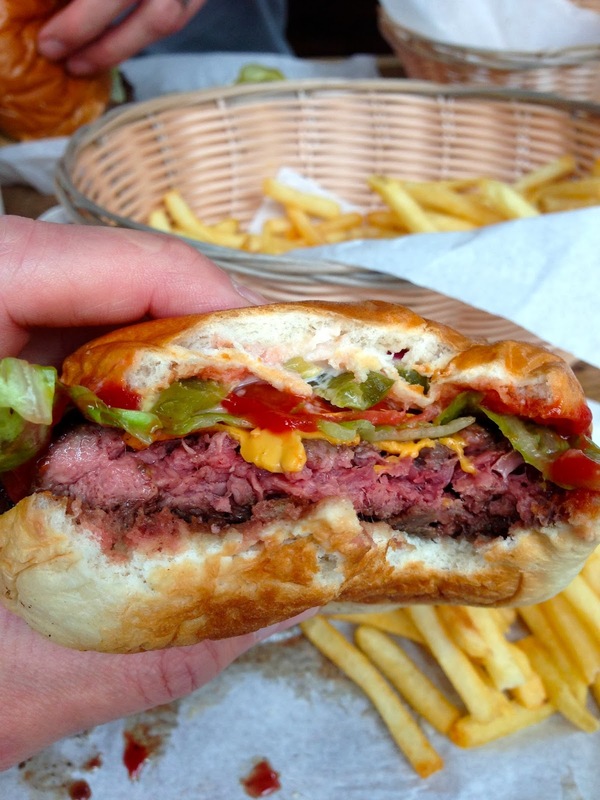 While you could get lost in the burgeoning Bermuda burger triangle just north of Oxford Street, I'd like to resurface at Tommi's over MEATLiquor and Patty & Bun any day. The venue is light and bright (looking at you ML) and I prefer the Tommi's bun over that of the P&B crew. But if there's a food that polarises people more than any, I reckon it's a burger, given the many variables involved in its construction, so feel free to disagree. Tommi's landed in London from Iceland last year in a temporary location before setting down roots on Thayer Street in Marylebone. There's no rags to riches story of food truck to permanent home, but I don't think that does the guys at Tommi's a disservice. They'd perfected the burger on their home turf first before getting stuck into the competitive London burger scene. The menu is thankfully brief and focused. Four types of burgers, if you count the veggie burger too (and generally a monthly special - before Christmas it was a venison burger, natch), fries and drinks (soda's, shakes, wine and beer). You can customise your burger with additions like bacon or a bearnaise sauce, but I tend to take my cheeseburger as is (it comes with red onion, lettuce, tomato, mayo, ketchup and mustard) and play with the free condiments on offer like, pickles, hot sauce, caramelised onions and the like. My cheeseburger patty has always been cooked to perfection with a flavoursome charred exterior hiding the juicy, medium-cooked, roughly-chopped meat. It's that texture that I like most. The bun is soft but hangs together long enough to finish the burger, unlike the slop that is usually left at MEATLiquor. To my mind, Tommi's just tastes lighter than the local rivals which put me into a food coma. I like that Tommi's offer shakes too, although I've had one that was so thick it was better eaten with a spoon. If I have a criticism though, it's the fries. They're a frozen McCain's job and could be much more interesting if they made their own. Tommi's is in the process of expanding to a couple of new locations. A venue is soon to open on the King's Road in Chelsea, while there was talk of an East London location too. More imminent is a pop up at the The Princess of Wales pub in Primrose Hill on 16 January. Spreading the Tommi's burger love can only be a good thing, even in the crowded London market. Dabbous: is it still worth the wait?